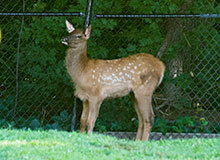 The Milwaukee County Zoo is excited to announce the birth of a baby elk on June 22. The female elk calf Arya was born to mom, Charissa (6 years old) and dad, Comanche (17 years old), with zookeepers recording a weight of 40 pounds at birth. Although 17 is considered quite mature for a male elk, Comanche is doing great for his age! The calf will nurse from mom for the first two to three months and will later move on to eating hay, grass, herbivore pellets, and twigs and young shoots of trees—our elk are especially fond of nibbling on evergreen trees! Enrichment activity for the Zoo’s elk collection includes zookeeper interactions as well as providing new and varying types of produce, all of which allow the animals to express their natural behaviors. Elk are also very scent-motivated and enjoy different types of smells found in a variety of perfumes and hunting scents. Mother and baby spent the first two weeks in their own separate area, as mom continuously nursed and tended to her calf. Zookeepers have been monitoring the pair closely and report that the bond between them is strong. After about two weeks, the calf began to follow mom around and was later introduced to the exhibit and the rest of the herd. The other female elk were initially very curious about the new addition and welcomed the baby under mom's watchful eye. Mom and baby are enjoying spending time grazing and relaxing with the rest of the group. 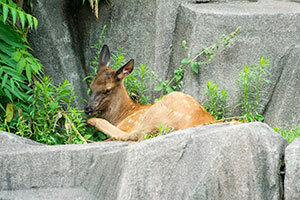 The calf is now on public exhibit in the outdoor Elk Yard, and will likely stay at the Milwaukee County Zoo as part of its elk collection.